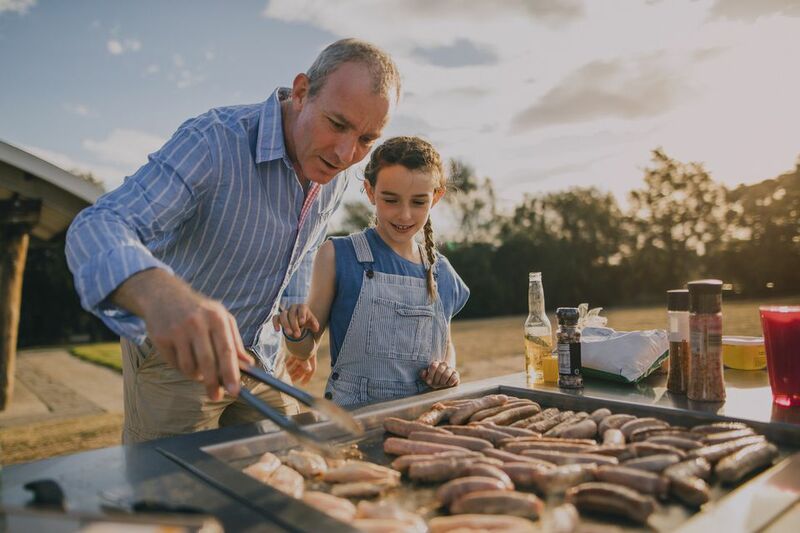 While the environmental impact of grilling is negligible compared with most of the other things we do in our day it is important that we take every aspect of our lives into consideration when it comes to combating air pollution and our carbon footprint. You can make grilling green by making a few changes to the way you grill and the kinds of products you buy. Try out these suggestions to make your outdoor cooking more environmentally friendly. Avoid petroleum-based lighter fluids and self-lighting charcoal. These release petrochemicals into the atmosphere. Instead, use a charcoal chimney, an electric charcoal starter, or natural lighter fluids to get your fire going. Choose a superior charcoal. Natural charcoals and lump charcoal made from furniture scraps and waste wood without additives and binders make a cleaner fire that not only reduces your pollution output but improves your grilling experience. Switch to gas. Gas grills are much more energy efficient than charcoal grills and produce far fewer pollutants. Reduce preheat times. Most gas grills are ready to cook in 5 to 10 minutes. Charcoal takes 15 to 20 minutes to be ready for cooking. Plan your cooking time to correspond to when your grill is ready and don’t leave your grill burning any longer than you need to. Clean out your grill regularly. Build up of grease and food particles in your grill will produce unnecessary smoke. Also, take this time to clean out grease drip trays under your grill. Avoid disposable dishes and utensils for your next cookout. A few minutes washing dishes is better than a pile of paper plates and plastic forks in the garbage. Make informed decisions about your next grill. Unfortunately, many grills built today, particularly gas grills, are simply not built to last. Buying a higher quality, longer lasting grill will not only save you money in the long term but reduce the pollution from manufacturing, packaging, shipping, and recycling (hopefully) of the grills you buy. Charcoal produces more pollution than gas or electric grills, but for many of us, the better flavor and versatility charcoal make it a hard habit of giving up. To reduce the impact of burning charcoal, look for the purest solution. Think about this. A branch falls from a tree in your yard. You leave it to decay. According to the U.S. Department of Agriculture, the carbon released by this decay is the same as if you burned the wood from the branch. Granted, burning puts that carbon quickly into the atmosphere but the end result is the same. Now imagine that you ground that wood into sawdust, combined it with binders to make it stick together, and then fired it into charcoal. This process adds pollutants to the charcoal and increases the carbon output. If you were to then add lighter fluid you would dramatically increase the pollution created. By choosing natural, additive free charcoals, or natural lump charcoal you eliminate these additives and therefore make a cleaner fire. You also reduce the chemicals in the smoke that may taint the flavor of the food you cook. The EPA lists volatile organic compounds (VOCs) as a dangerous ozone-causing pollutant. Every year Americans along release over 14,000 tons of VOCs into the atmosphere from the 46,000 tons of lighter fluid burned every year. Putting down the lighter fluid greatly reduces the pollution from grilling. Additionally, self-lighting charcoal is no better for the air. Your best choice for lighting charcoal is to switch to a charcoal chimney, electric charcoal starter, or use a natural combustion agent like fatwood. These methods are also safer considering that lighting charcoal is the greatest cause of barbecue-related injury. While it is true that a natural gas grill or an electric grill is the greenest grill from the perspective of air pollution it must be considered that grill durability is a major issue for the outdoor cook. Replacing a cheap grill every three or four years does far more damage to the earth’s resources than buying a grill designed and built to last for many more years. When you consider manufacturing, packaging, shipping, and disposal, the short life expectancy of many grills made these days poses a significant impact to the environment. Buy quality products, take good care of them, repair as needed, and don’t replace them until necessary. When it comes to charcoal grills, look for one that can be shut down. This means that when you are done grilling you can close the vents and the lack of oxygen will put out the fire saving the remaining charcoal for your next cookout. When it's time to light up the grill again all you need to do is shake off the ashes, add a little more charcoal and light. This lets you control how much you burn and reduces the amount you spend on charcoal. Careful management of the charcoal you burn can save you a lot of money and be good for the environment. Want a good burger? Grab the family, jump in the car, drive to your favorite burger joint, spend too much money, and then drive home. How much energy and time did you spend? Since grilling doesn’t lend itself to prepackaged foods and gives you an easy way to produce good meals from scratch. Buy fresh meats and vegetables and grill them up without having to unpack all that "stuff" they sell in the middle of the store. Additionally, grilling lets you turn off the stove and oven reducing your electrical usage. Since about 7% of the electricity used in the U.S. is renewable you can cut down on your electric bill and reduce pollution from power plants. So fire up the grill and put the guilt aside.